Remember when you had the case of mixed tapes in your vehicle? Then we went to the space-saving design called “CDs”? Let’s not forget to mention the “CD Changer,” the ultimate solution for mixed music. Then we had the CD pouch cases…some people had two or three cases in their vehicles. Then along came the dreaded MP3, ultimate solution to having hundreds of CDs in your car. But, wow, my Steve Miller’s Greatest Hits MP3 sounds terrible. If you laughed at the above paragraph, your dating yourself, but it is the progression of media in mobile electronics. In the quest for the ultimate digital music in your vehicle, people have been installing different home docks for iPod or other storage devices. The process usually involves converting a device from 120-volt to 12-volt applications and then using a digital output into a head unit. This sounded great in theory but does it work? This application has some drawbacks, usually has issues with noise, pops, whistles and a ground loop. What if your head unit doesn’t have a digital input? Now you will use digital to analog converter to go into an auxiliary of some sort? That’s a lot of work. I want to listen to my Steve Miller…not to mention the dollars spent. There has been this absolute impressive trend of mounting an iPad in the dash of vehicles, this looks awesome, but most people are using the 3.5mm headphone jack into an auxiliary input. Let’s not debate the sound quality of this application. Audison’s Bit Play has an exciting way to overcome these issues above. They have built digital audio storage and delivery system made for the automotive environment. The only problem is the interface system. You can use an IR remote to change the songs etc. but there is no screen. 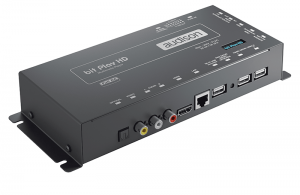 The Bit Play does use a composite video out and an HDMI output. If your head unit has these features, you can use the on-screen display and the IR remote combination to navigate your music. It utilizes AM internal hard drive and can be expanded to use multiple hard drives via USB. This product has been in development for roughly three years, they have some bugs to work out, but we will undoubtedly be watching this product in the future.